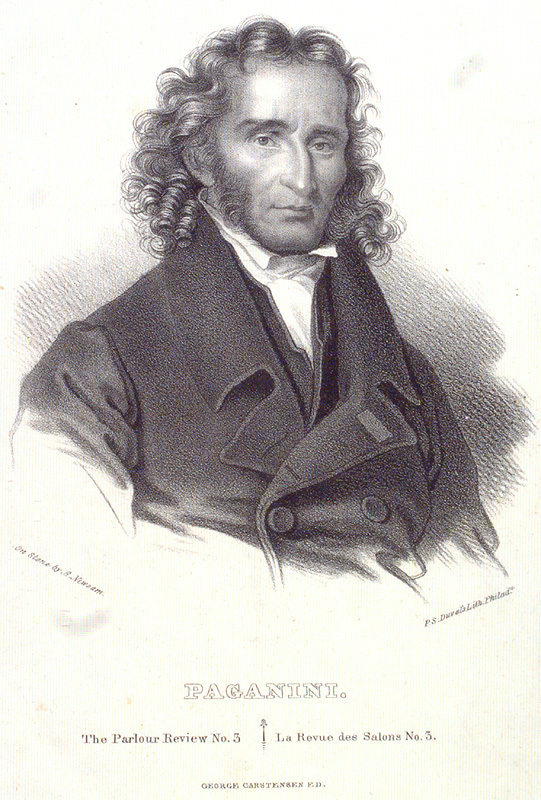 Nicolo Paganini was born in Genoa in 1782. Nicolo was sickly as a child. His father, a mandolin player, gave him violin lessons starting at age 6 or 7 and forced him to study and practice long hours. May 31, 1794 Nicolo Paganini made his public debut in Genoa at the age of 11. In 1795 Paganini moved to Parma to study under the famous violin teacher Alessandro Rolla. Rolla said that there was nothing more that he could teach the boy. Paganini began a period of self-study, often practicing 15 hours a day. In 1797 he began to make solo tours, which he stopped in 1805 to be court violinist for Napoleon's sister. In 1808 Paganini reverted to solo work. A Paganini performance was stunning. Until this then, violinists had used sheet music even during performances. Paganini memorized pieces. He would stride onto the stage, toss back his black hair and play. His technique was stunning. It is said that when he played tender passages the music was so beautiful that his audiences often burst into tears, and yet, he could perform with such force and velocity that at Vienna one listener became half crazed and declared that for some days that he had seen the Devil helping the violinist play. Besides performing, Paganini wrote many of the pieces for his concerts. It was said that Paganini had been imprisoned for a love affair with only his violin for company. During the alleged prison term all three upper strings had broken, and so Paganini had continued to play on only his G-string. Paganini claimed that the stories were false, but they took root among the audiences, and the reputation stuck. Paganini implemented left-hand pizzicato (plucking the string --usually open strings-- with the left hand) This allows more rapid changes from bowed to plucked notes, and creates a stacatto sound. Paganini used harmonics extensively. Harmonics are created by placing a finger on the left hand lightly on the string ins specific places while bowing. The result is an ethereal, high pitched note that is very unlike notes played normally. 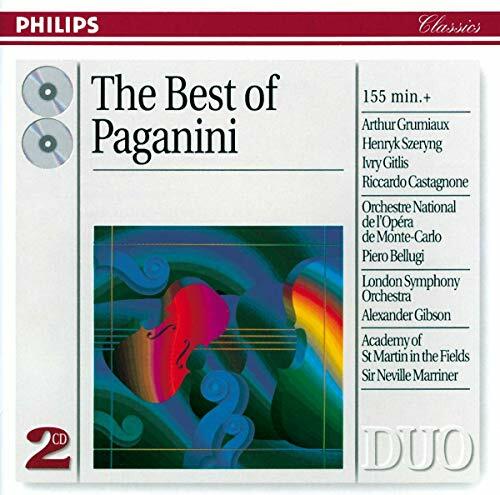 At times Paganini would use the G-string for entire works; This only served to promote the stories of his imprisonment, but showed incredible mastery of the instrument. And Paganini became famous for the use of bizarre fingerings. It was also said that many of Paganini's performances were blazingly fast. He could play at the astounding rate of twelve notes per second. All of these innovations combined with his amazing mastery of the violin resulted in a performance that created sounds theretofor unheard by many audiences. Paganini became wealthy due to his skill on the violin. He rarely practiced after his 30th birthday. 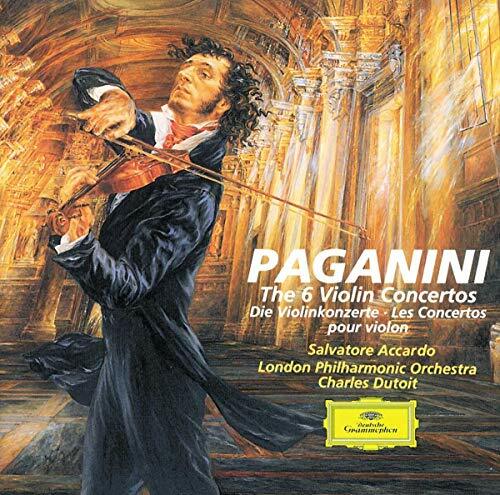 Paganini died May 27, 1840. A truly bizarre story concerning Paganini's death further impressed the myth of Paganini's dealings with the devil. It seems that Paganini had refused to take Communion prior to his death. Some said it was because he was convinced he was not about to die. Others said he was an unbeliever. Others speculated even more wildly. Whatever the reason, Paganini's refusal of the sacrament caused the local church to refuse permission to bury his body. As a result, it is said that Paganini's family kept his body in a basement for five years, until their petition to have him buried was allowed. So even after his death, the legend of Paganini held the public spellbound! The music you hear in the background is from a Caprice written by Niccolo Paganini. The sheet music sample you see below is courtesy of our partner SheetMusicPlus. It is a sample page from an outstanding annotated edition of the Paganini Caprices. Click the page to get more information about this edition. 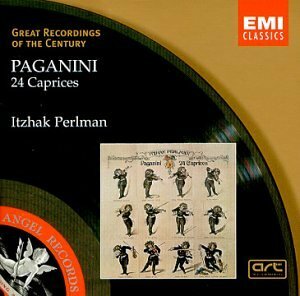 You can see all of Paganini's works available through SheetMusicPlus by clicking here. Paganini and Music Minus One! You Get To Play Along With the Orchestra!